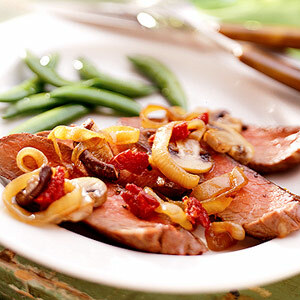 We took a favorite dinner recipe, steak with mushroom sauce, and boosted its flavor and colors with caramelized sweet onions and red dried tomatoes. Separate caps and stems from shiitake and oyster mushrooms. (Reserve stems to use in stock or discard.) Coarsely chop mushroom caps. Set aside. In a large skillet, cook onions, covered, in 1 tablespoon of the hot butter over medium-low heat for 13 to 15 minutes or till onions are tender, stirring occasionally. Uncover; cook 3 to 5 minutes more or till onions are golden. Remove onions using a slotted spoon; set aside. Add mushrooms and remaining 1 tablespoon butter to skillet. Cook and stir over medium-high heat about 8 minutes or till tender and liquid has evaporated. Stir in onions, tomatoes, vinegar, the 1/4 teaspoon salt and 1/8 teaspoon pepper. Heat through. Meanwhile, preheat boiler. Place meat on the unheated rack of a broiler pan. Sprinkle with additional salt and pepper. Broil 3 to 4 inches from heat for 12 to 14 minutes for medium rare (145 degrees F) or 15 to 18 minutes for medium (160 degrees F), turning once halfway through broiling. Spoon onion mixture over steaks. Makes 4 servings. Substitute 5 ounces fresh button mushrooms for the 3 ounces fresh shiitake mushrooms and 2 ounces fresh oyster mushrooms, if you like.